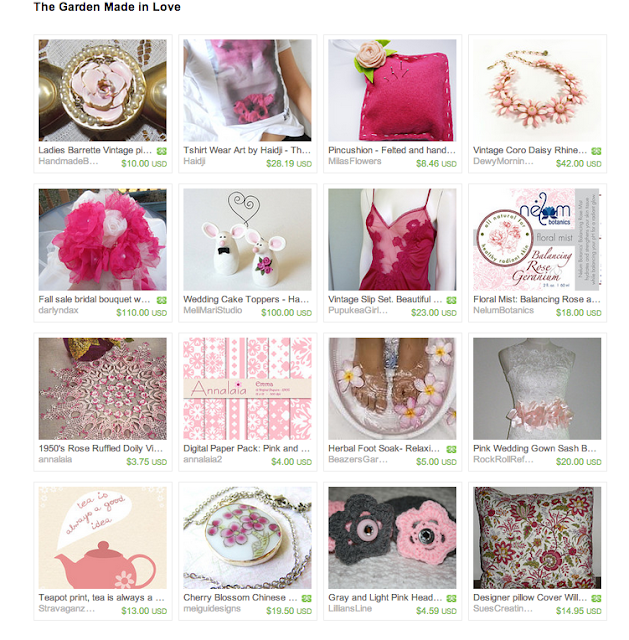 Here are two treasuries with themes of love, showing that we don't need to save it for just one day of the year. The first is by Llona from Nonoluna, a shop specializing in beautiful art photography and wearables. Comprised of items from crafters in the Made in Love Team on Etsy, "The Garden Made in Love" features lovely items like a vintage slip set, a colorful digital paper pack and my herbal foot salts. Next up is one from Beth of bprdesigns, "Will You Be Mine?" a collection of HEART felt items, from Craftoriteam that will leave any giftee weak with love, like a sterling silver ring and my Pamper Yourself Bath & Body Giftset. Visit these shops and show your love!